Medial pterygoid closes your mouth - When you say "M" you have to close your mouth. Lateral pterygoid opens your mouth - When you say "L" you have to open your mouth. Normally this causes no symptoms, and this is called Chilaiditi's sign. The sign can be permanently present, or sporadically. This anatomical variant is sometimes mistaken for the more serious condition of having air under the diaphragm (pneumoperitoneum) which is usually an indication of bowel perforation. This may lead to unnecessary surgical interventions. Chilaiditi syndrome refers only to complications in the presence of Chilaiditi's sign. These include abdominal pain, torsion of the bowel (volvulus) or shortness of breath. Chest X-ray showing obvious Chilaiditi's sign, or presence of gas in the right colic angle between the liver and right hemidiaphragm. Hamman's syndrome is a syndrome of spontaneous subcutaneous emphysema (air in the subcutaneous tissues of the skin) and pneumomediastinum (air in the mediastinum, the center of the chest cavity), sometimes associated with pain. Hamman's syndrome can cause Hamman's sign. The syndrome is caused by alveolar rupture and can be seen post partum. It most commonly occurs in young women. 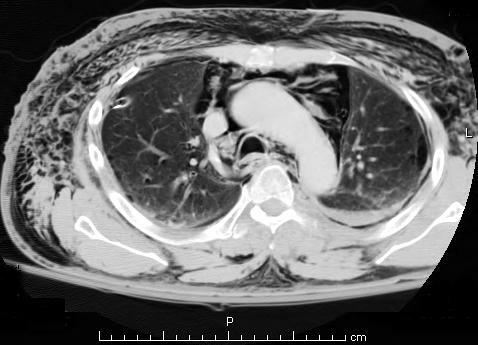 A CT scan showing air in the mediastinum with subcutaneous emphysema, which can result in Hamman's syndrome. Hamman's sign (rarely, Hammond's sign or Hammond's crunch) is a crunching, rasping sound, synchronous with the heartbeat, heard over the precordium in spontaneous mediastinal emphysema produced by the heart beating against air-filled tissues. It has been described as a series of precordial crackles that correlate with the heart beat and not the respirations. Q. 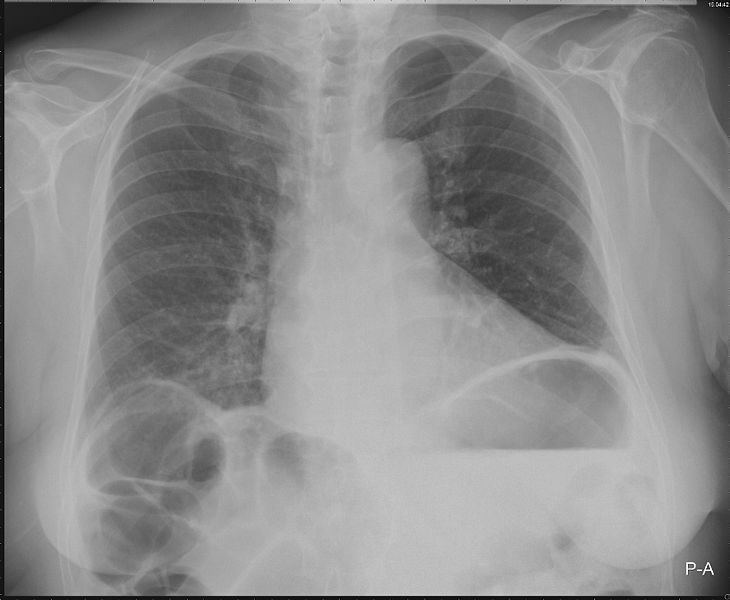 Most common cause of tree in bud appearance on HRCT chest is? NOTE: similar ques was asked in aiims nov. 2010 where the difference was that the patient had undergone bone marrow transplant and then showed this Tree In Bud appearance, so then the answer will be Pneumocystis carnii. Q.Site of action of loop diuretics? Q. Drug exclusively excreted by Kidney? Q.multiple lesions in liver,diarrhea and flushing seen in a patient. what is the most probable part where the lesion is located? ANS : D.. Small Bowel. Q. leprosy is seen in? Laboratory tests measure the amount of copper in the blood, urine, and liver tissue. Most people with Wilson disease will have a lower than normal level of copper in the blood and a lower level of corresponding ceruloplasmin, a protein that carries copper in the bloodstream. In cases of acute liver failure caused by Wilson disease, the level of blood copper is often higher than normal. A 24-hour urine collection will show increased copper in the urine in most patients who display symptoms. A liver biopsy—a procedure that removes a small piece of liver tissue—can show if the liver is retaining too much copper. The analysis of biopsied liver tissue with a microscope detects liver damage, which often shows a pattern unique to Wilson disease. Q.Resistance to acyclovir is treated with? Flexor Digitorum longus crosses medial surface of Sustenticulum tali . here answer clearly is option B because 4th nerve supplies contralateral sup. oblique..
Denotes possibilities of fetal anomaly.